This is not your mother’s Anne Frank. 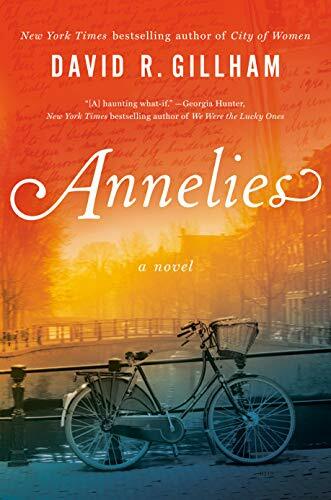 Instead, the new novel Annelies is a presumably happier alternative history in which Anne doesn’t die in the Bergen-Belsen camp. But merely living does not always equal a happy ending. In Annelies, bestselling historical fiction author David R. Gillham has taken the brave, difficult risk of turning an icon into a real teenager, with all of the character virtues and flaws that are apparent in the actual diary plus survivor’s guilt, anger, depression, and more. He largely succeeds, although the pounding of repetition drags down the narrative. In this version of her life, Anne survives the horrors of Bergen-Belsen through willpower, luck, and the tiny bit of extra rations that a more privileged inmate sneaks to her. After the camp is liberated, she returns to Amsterdam, where she reunites with Bep, other friends, and her father, Otto, who has resumed his prewar job managing a spice trading company. No one, however, can truly return to the old roles. Anne had once adored Otto. Now she blames him for not saving her mother and sister, for not telling her what’s happening with his business, and for just not being as angry with the world as she is. Unmoored, Anne doesn’t want to go to school. She doesn’t much want to work in Otto’s office. She rejects nearly all offers of friendship. She even smokes. As with police sketches that try to imagine what a missing child might look like 10 years later, author Gillham must “update” the Anne of the beloved diary, adjusting for the trauma of the Nazi camps, plus the normal process of adolescence. In general, he manages a sensitive shift to Anne 2.0. Perhaps, however, he goes too far. Although the novel positions Anne as the story’s strong, truth-seeking, tortured hero, it also makes her a bitter, self-righteous scold who is hard to sympathize with. “You’ve been twisted by your experiences into a kind of morose, self-absorbed little tyrant who demands that everyone worship her pain and loss as much as she does,” her (fictitious) stepmother, Hadassah, lectures Anne, in a rare moment of criticism. The book’s main flaw is the repetitive scenes—especially those where Anne condemns Otto—that don’t seem to develop her self-awareness until nearly the end. True, survivor’s guilt and PTSD are not easy to overcome. But a novel need not show ten instances of the same suffering to make the point. Gillham—who also wrote the best-selling novel City of Women, about the German women left behind in Berlin during World War Two—spent six years doing research for this book, and the result is impressive, particularly the details about postwar Amsterdam. That era was not a picnic of Gouda cheese and tulips: The Dutch coped with ersatz coffee, sugar substitute, unreliable trams, and bicycles without tires while spitting out plenty of lingering anti-Semitism. In the official publicity material, Gillham says the message of Annelies (which was Anne’s full first name) is “hope.” But there is also a more subtle message: that we shouldn’t romanticize our heroes. The world is lucky that Anne Frank left us her beautiful, painful diary. Certainly, the world would have been luckier if she had lived to write more. But her future writings, as well as her personality, might have been far darker and uglier than the 13-year-old whom we think we know.